The State of the Arts in Canada: Past Show – The Square Foot Show @ AWOL Gallery « I'm Trying I'm Trying I'm Trying, Ltd.
AWOL’s Square Foot show this past summer (August 15th-Sept 6th): we got into town too late to be able to catch the show for more than a quick look in the (smaller) main AWOL space, but the highlights for us were clearly the more sculptural or conceptual pieces, including the straight-up dioramas. Wish we’d taken more photos. 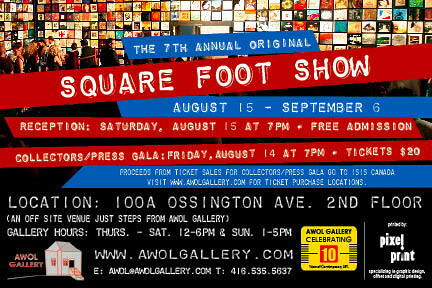 It takes place at AWOL Gallery, 76 Ossington Ave, Toronto, Canada.